You know that saying, “You never get a second chance to make a first impression”? When it comes to your job search, it’s especially true. Most hiring managers spend a mere six seconds reviewing each resume they receive, according to a study by The Ladders — which means yours has to stand out for all the right reasons. Because if there’s anything worse than having your resume passed over as mediocre, it’s having it passed around by fellow hiring managers for a good laugh. To learn how to write a resume that leaves a lasting (positive) impression, check out these all-too-common resume mistakes, accompanied by real-life examples that missed the mark in a spectacular way. “The importance of details on a resume cannot be overstated,“ said Dr. Heather Rothbauer-Wanish, owner of Feather Communications and a certified professional resume writer. By far the biggest complaints we heard from hiring managers and resume pros were typos and other errors a simple once-over could easily have caught. Basically, lesson one in How to Write a Resume 101 is to proofread! “Perhaps the most unusual mistake that I ever saw was a cover letter and resume that we reviewed in which the applicant misspelled his own name!” said Timothy G. Wiedman, retired Associate Professor of Management and Human Resources at Doane University. “The spelling of the applicant’s last name on the cover letter did not match the spelling of his last name on the resume — two letters were transposed. The members of the search committee were not really sure what his name was until we later received his transcripts. You’ll also want to make sure you send the right resume to the right company. And of course, make sure your contact information is correct. “One client specifically stated that he couldn’t believe he wasn’t getting any responses to his resume,” said Rothbauer-Wanish. “I reviewed it and it looked fairly good. Then I started comparing his email address and phone number he had contacted me from versus the one on his document. He had the incorrect phone number listed on his resume — two of the numbers were transposed at the end. Spellcheck is a great tool, but it doesn’t recognize context, so don’t think you can skip the proofreading step just because you’ve used it. “We had one applicant who sent a resume that had numerous typos on it,” says Bob Bentz, President of Purplegator. Another problem? This gaffe shared by JobMob: “Experience: ‘Child care provider: organized activities; prepared lunches and snakes.” Yikes! 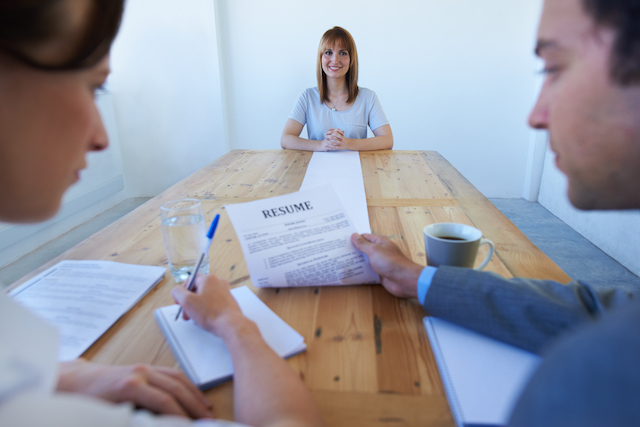 “The resume template is a blessing for some job seekers,” said Clair Jones, Chief Strategy Officer of Witty Kitty Creative, “but make sure you remember to fill in all the fields and never leave copy original to the template. “We had one applicant for a freelance position who applied as ‘John Smith,’ though that was definitely not his name and did not match the rest of his information. While it was hilarious and an honest mistake, it definitely showed that he lacks the attention to detail we look for in a new hire. If you’re up for using a resume template, this site has tons of free options you can use. Another option is to check Etsy for more creative versions. Just don’t forget to change all of the pre-filled information to your own. We were amazed and horrified to find how many of our sources had stories of blatant oversharing by job applicants. “People sharing their hobbies and personal tragedies in the resume is one of the fastest ways to being cut from consideration,” said Dirk Spencer, recruitment adviser and author. “Happily married with three beautiful kids. — Lori Bumgarner, M.Ed., passion and career specialist at paNASH. — Scott Love, legal recruiter and owner of The Attorney Search Group. There’s some debate in career spheres over whether you should include a photo on your resume at all. We’d say it’s probably best to play it safe and leave one out — especially if you’re going to follow the examples below. Phoebe Aitken, HR Specialist with Voices.com, has seen more than a few “applicants adding inappropriate photos of themselves to their resume,” she said. “In my experience as a recruiter, I’ve seen many aspects of epic fail, with… the most excruciating fails appear[ing] mostly in cover photos,” said Galin Kolev, marketing manager of Fantastic Services. Your resume isn’t the place to attempt to show off your shining personality. Leave that for the interview — which you will only get if your resume is a polished presentation of your skills, experience and accomplishments. You may think you’re injecting some humor and levity by stating your objective is “to become Overlord of the Galaxy” or augmenting “I have a lifetime’s worth of technical expertise” with “I wasn’t born — my mother simply chose ‘eject child’ from the special menu” (actual resume excerpts shared on JobMob). But all you’re really doing is giving your resume a one-way pass to the trash bin, according to the experts we spoke with. One of his favorites was an enigmatic bit of literature where the job seeker “wrote the whole thing in second person and managed to make it embarrassingly self-aggrandizing,” he says. As far as experimental writing goes, it’s amusing if nothing else. But as a cover letter? It’s a train wreck. That said: Know your audience. If a company showcases this type of personality on its own website and social media channels, your creativity might be a hit. Whether it’s embellishing the facts or “straight-up lying,” as Russab Ali, Founder of SMC Digital Marketing, put it, it’s not cool, and hiring managers will spot it. Fair enough, but no one would doubt you if you claimed you were once on an NHL team, right? Pierre Tremblay, Director of Human Resources at steam cleaning supply company Dupray, offered this story of a job seeker so brazen it boggles the mind: “We had a candidate lie specifically about being part of a professional sports organization. This individual said that he was a former player of the New York Islanders. Your Turn: Have you been guilty of any of these resume faux pas (even if on a less epic level)?